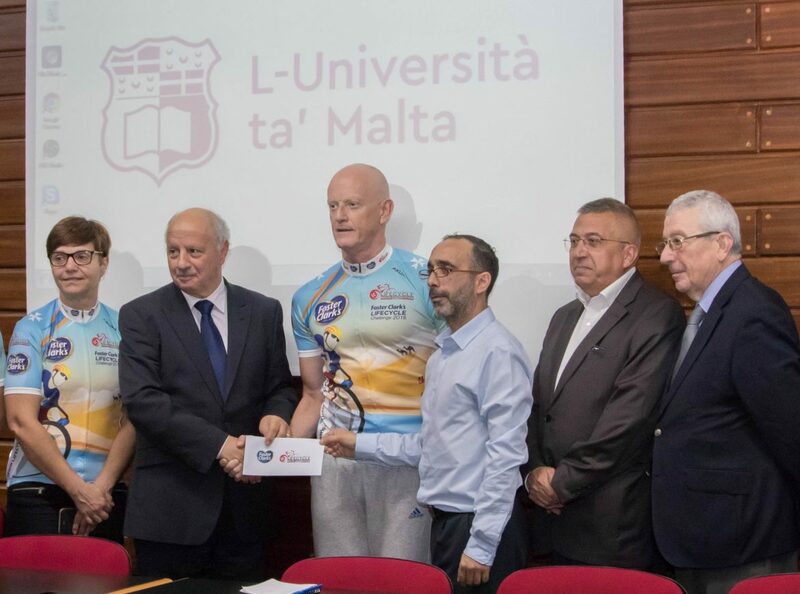 LifeCycle (Malta) Foundation donated €25,000 to the University’s Research, Innovation and Development Trust (RIDT) to further the specialised medical programme in kidney research at the University of Malta (UM). The money was initially received by LifeCycle as part of the 2018 title sponsorship by Foster Clark Products Ltd.
LifeCycle Founder Alan Curry, in the presence of Foster Clark’s Regional Sales Manager Simon Pace, presented the money to the University Rector and Research Trust (RIDT) Chairman Professor Alfred Vella. In the past four years LifeCycle Foundation has donated a total of €120,000 towards the kidney research project. Prof Alex Felice together with a team of scientists, namely lead researcher Dr Valerie Said Conti and Ms Esther Zammit are currently investigating what causes children to be born with congenital anomalies of the kidney and urinary tract (CAKUT). These anomalies, which arise from defects in kidney development before birth and are the commonest cause of end-stage kidney disease in children, are thought to result from an interplay between genetic factors and environmental hits which influence the developmental pathways. The researchers have established a high-quality kidney disease biobank at the University of Malta where biological samples from families of children with CAKUT are now stored. They have looked at potential risk factors during pregnancy and have performed ultrasound studies on the first-degree relatives. It was determined that 3 of 26 (11.5%) individuals had a renal anomaly which compares well with a family history of 10% reported in the literature. Using Next Generation Sequencing, a modern technology which allows the human genome to be sequenced rapidly and in great detail, the researchers at UM have identified a number of variations in the genomes which play a part in development. Since CAKUT is classified as a rare disease and the number of individuals studied by any research group is small, the data will contribute to the larger pool with the aim to develop preventive measures and individualised therapy in the future.